Have you considered using a marketing tracking system? Do you connect with customers and prospects with email? Social Media? Do you give them links to follow back to your website? Do you wonder if anyone follows the links you send? And what happens when they get to your website? Have you looked into marketing automation systems and been floored by the cost? And are you overwhelmed by the complexity? With a few free resources and some effort on your part, you can track inbound links. You can see what prospects are doing with your very own marketing tracking system. Let me explain. First, and it’s likely that you already have this in place, install Google Analytics. GA is a powerful, and free analytic platform provided by the pointed headed ones at Google. The user interface is not very friendly, and there’s the whole big brother is watching factor, but did I mention that it’s powerful and that it’s free? 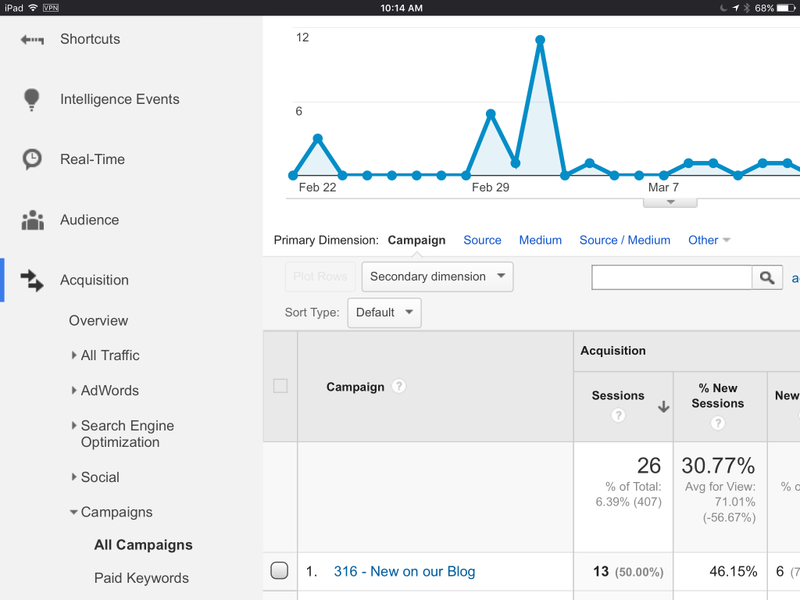 Google analytics is the foundation for a marketing tracking system for the rest of us. Then search for and bookmark the Google URL builder. There is also a Chrome extension that you can use. Store your tracking URL tags in your memory aid of choice. I use Evernote for this. Then copy and paste the appropriate tag after the URL in your browser’s address bar. The tracking tag is blue; it starts with a question mark (?utm…). I use TextExpander from Smile Software to make it easy to add the tracking tag to any URL I’m sending. This utility isn’t free but will save you lots of time. It types out text strings via a preset abbreviation. At this point, you are good to go but let’s face it, the above isn’t the most beautiful looking URL. For the uninitiated, it could be off-putting. 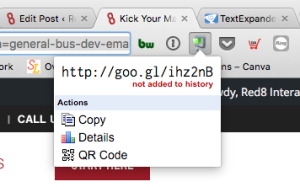 You can use a free utility for Chrome, the goo.gl URL shortener, to shorten and frankly disguise the URL. There are other services for this, bitly is most well known. Many of these services offer tracking and other features. Google Analytics uses the tracking tags you added to the URL to identify this traffic. Then it can separate it from the traffic that gets to your site through other means. You can now see the results of your marketing efforts. 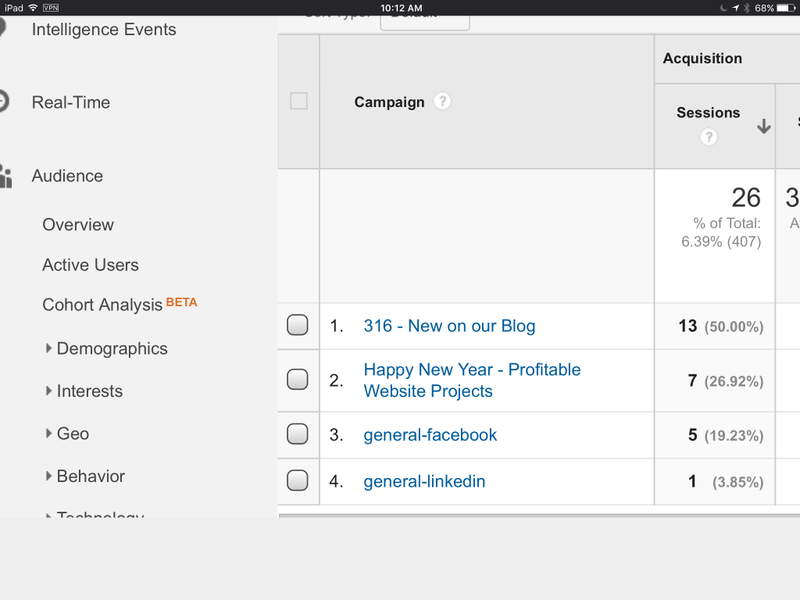 Log into your Google Analytics account and navigate to Acquisition > Campaigns > All Campaigns. You will see lots of data about the clicks you received and what the visitors did after they got to your site. You can dig deeper into each entry. Here you can see that our marketing emails are more successful at driving traffic than other social media channels. In this post, we’ve described a simple, low-cost marketing tracking system. With a bit of effort on your part, it will give you lots of insights into what’s working and what’s not. It doesn’t give you a lot of in-depth information. But you will have more information than you have without any marketing tracking system. Time to send out another marketing email.